It is appropriate that my last full day in Rome for this year should be the patronal feast of the city. The idea of tourists coming to Rome to see the Pope is a modern phenomenon. For centuries, pilgrims came to Rome primarily to pray at the tombs of the two great martyr-saints who are honored as the “co-founders” of the Church of Rome, even though Christians were certainly present in the city before either Apostle arrived: Sts. Peter and Paul. Throughout the Eternal City, you will see both saints together. On the Piazza in front of St. Peter’s Basilica, you see two giant statues, Peter on the left and Paul on the right. 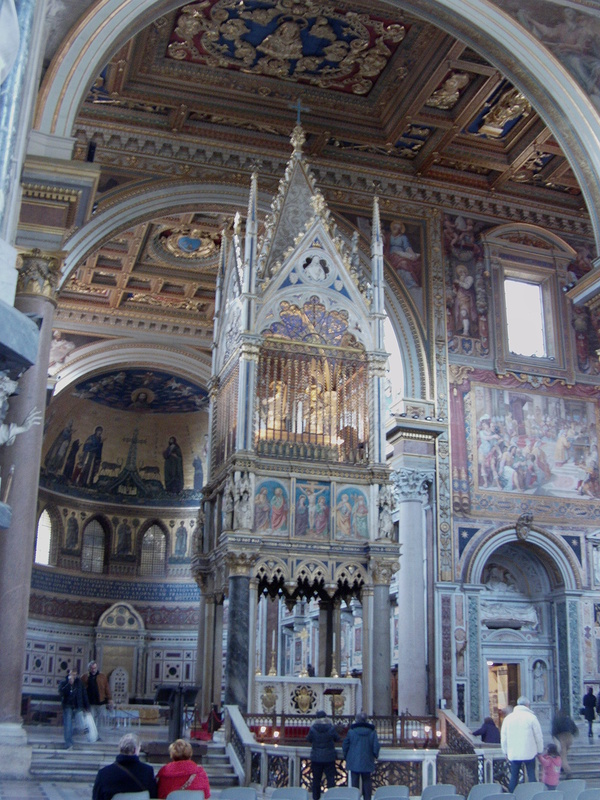 Atop the baldachino over the papal altar in Rome’s Cathedral-Basilica, St. John Lateran, two gold reliquaries house purported relics of each of the saints. 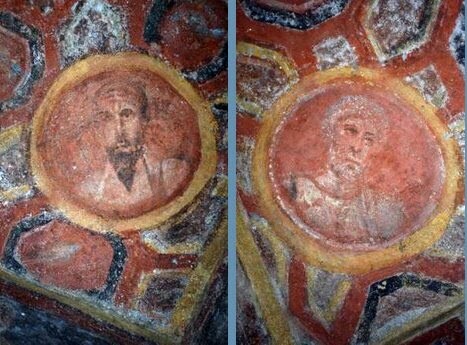 The oldest known depiction of either saint is a depiction of both, at the catacombs of St. Thecla. If you want to see the famous mosaics of the bishops of Rome, from Peter to Benedict, you go not to the Vatican Basilica, but to St. Paul’s Outside the Walls, which from the 4th to the 16th centuries was the largest church in Rome, until the new St. Peter’s was built. The “Successors of Peter” were honored at the Tomb of Paul. No wonder ecclesiologists point out the pope is better named “Successor of Peter and Paul” – if they are not too busy pointing out that neither Peter nor Paul were bishops of the city in the modern sense, but that is another debate. This celebration also serves as the “Pallium Mass” when the (Catholic) Metropolitan Archbishops appointed within the last year come to Rome to receive the symbol of their office. Made from wool shorn of sheep blessed on the Feast of St. Agnes, the pallium is one of the oldest liturgical vestments, having changed size and function over the centuries but remaining in use throughout. 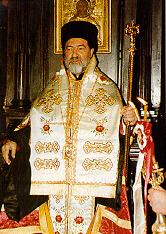 The tradition of metropolitans coming to Rome to receive the pallium is recent, however, dating only from 1984. Prior to this they were vested in their own cathedral at the time of their installation as Metropolitan. However, it serves as a powerful symbol of the communion of the bishop of Rome with the archbishops throughout the world. 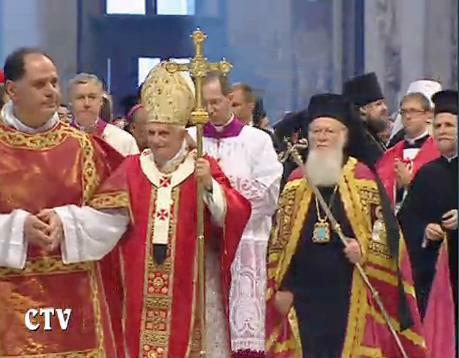 The unity of the Church is the clear theme of the day– the pallium celebrating the existing full communion between Rome and the churches represented by the new metropolitan Archbishops, and the kiss of peace and exchange with the Orthodox delegation celebrating the impaired communion with the Orthodox Church in hope for full communion in the near future. Appropriate that the city that sees itself at the centre of this union is guided, not by a solitary figure, but the “dynamic duo” of two very different Apostles. May the church continued to be blessed by their common patronage and the balance that they represent! Over the summer months I will be travelling a little, teaching a little, and spending a lot of time with family and friends near Seattle. My blogging will slow (and indeed I am writing some of these rather post-facto) but I will also have some time for more meaty reflection on some of the themes and events raised during this incredible year in Rome. By A.J. Boyd in La vita Roma on June 29, 2010 .